Have I ever mentioned how invisible whales are? Below water they blend in amazingly well. No, they don't just blend in, they actually disappear. 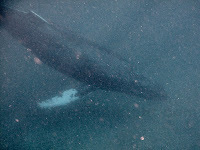 On my swim this morning, this whale suddenly materialized directly below me resting on the bottom. 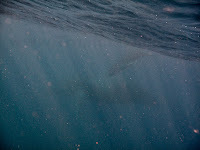 Even though it was only thirty feet down, I could barely see it. I was really worried that it might hit me if it were to surface - it was that close. I carefully moved away from it and it vanished from sight. 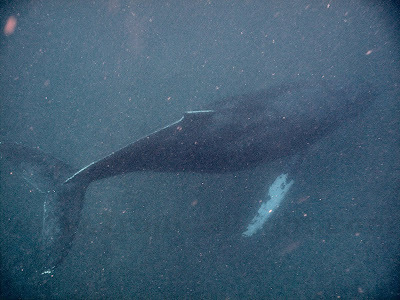 So I waited with my head above water, and a baby and mom surfaced less than thirty feet away. They felt almost close enough to touch (I guess because they are so big) but I absolutely could not see them when I stuck my head below water. As you can see from the photo they are nothing more than ghosts. Oh, and for you Pink Cap swimmers, they were on the inside of our usual Sunday swim course. Bring your ouija boards this weekend and maybe we'll be able to raise some of these spirits from the depths. OMG Don awesome! Those pictures are just wonderful! Seeing them how "it is" brings a whole new meaning to the Ocean and the harmony of those that live in it!